In the rugged White Mountains above the Owens Valley, bristlecone pines have been clinging to shear limestone slopes for thousands of years. Sole sentinels in a place few life forms can tolerate, these trees routinely endure impossible conditions, including six months of freezing temperatures each year, and perpetual drought. The oldest tree in this forest of ancients, Methusaleh, is close to 5,000 years old and lives in a forest of spiraling, wind-sculpted trunks and branches that will take your breath away. Join the staﬀ of The SummerTree Institute to walk among some the most ancient beings on earth during a three-day adventure that will introduce you to these magniﬁcent trees and the remarkable role they play in science, history, and the human imagination. Your stay for this adventure is at the rustic Crooked Creek Station and Lodge, located in the Bristlecone Pine forest at an elevation of 10,200 feet. Nestled in an alpine meadow that oﬀers superb views of the highest summits of the Sierra Nevada Range to the west, the modern ranch-style lodge will comfortably sleep our 25 guests. We will begin our alpine adventure at Big Pine, north of Bishop, California, and carpool from Big Pine to the lodge. 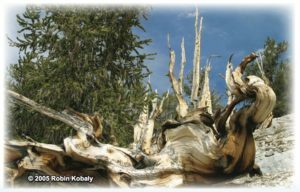 Walk among awe-inspiring bristlecone pine groves while you hear the intriguing story of these magniﬁcent trees and how they changed our knowledge of human history. We will explore the Methuselah Trail, with its famed though unmarked namesake, and other long-lived plants. If you enjoy stunning alpine surroundings, crisp, clean air, and night skies so clear you can almost touch the stars, you will not want to miss this trip. This is an opportunity to witness the enduring nature of high elevation life during its all-too-brief season of growth and accessibility. You will be amazed not only by these remarkable trees, but also by the rugged beauty of this remote piece of California. Join us to celebrate and honor these ancients on one of The SummerTree Institute’s native plant explorations. 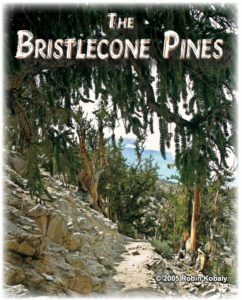 Our next expedition to the Bristlecone Pines is scheduled for Summer 2019, and we will be posting details here soon. You may sign up below to receive email notifications of our upcoming events.